Susan's Disney Family: Modern Furniture Warehouse, a great place to find wonderful items to decorate your home! Modern Furniture Warehouse, a great place to find wonderful items to decorate your home! Shopping for furniture? You have come to the right place! Let Modern Furniture Warehouse furnish your home with their unmatched collection of modern furniture. Modern office furniture, modern kitchen furniture, modern kids furniture, modern living room furniture and whatever style and design you want, modernfurniturewarehouse.com has it. Fun furniture designs, modern sofas, and modern tables and more. Find modern furniture for your bedrooms to create your sanctuary of sleep. Our modern kitchen furniture will let you entertain in style. Choose modern furniture set for a real deal. From cribs to toddlers, beds to bunk beds, find our modern kids furniture for all the little ones in your family. Beautify every room with our amazing modern office furniture too. Our house isn’t exactly large, it’s rather small but that’s what happens when you choose to live in a big city. So we need to be creative in how we store things and with a 7 soon to be 8 year old running around we have a surplus of certain item or shall I say items! We have toys a plenty in our house and they’ve taken over….EVERYWHERE! No matter how neat we try to make things it just always looks haphazardly put away. I know toy chests have a function but they look like a toy chest and I hate to have something like that sitting in my living room. I have finally found my perfect solution. 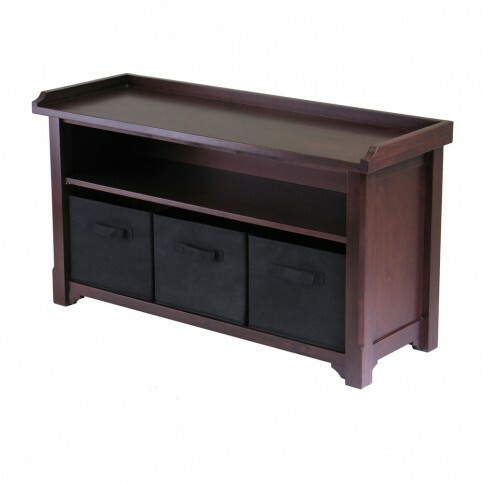 Modern Furniture Warehouse sent me a Verona Storage Bench with 3 Baskets that is not only functional but doesn’t make your living room look like Romper Room. We’ve been purging my daughter’s toy stash for the past couple of weeks taking bag after bag to Good Will so our stock is getting smaller and I was able to reclaim parts of my living room I haven’t had access to in a long time. The bench is a beautiful walnut and looks great sitting in our living room, the baskets do a wonderful job of keeping all her small dolls and accessories together and out of the way and the shelf space on the bench we use for keeping her Barbie cars on. And in a pinch we can place some seat cushions and use the bench as well a bench! The bench does require some assembly it’s not all that difficult because my non handy husband was able to do it and he kept the moaning/complaining to a minimum so that means the job wasn’t all the hard. The more griping he does the more difficult I know it is, just mention IKEA to him and he has known to become violent. With Thanksgiving soon upon us and this year being our first year hosting I really want to make sure the house looks its best and our new bench from Modern Furniture Warehouse will do that by getting the mass chaos of toys under control and letting us reclaim floor space. If you would like to add some new and stylish furniture to your home, I would highly suggest www.modern​furniturew​arehouse.c​om they have a wonderful selection with good prices, what more could you ask for. they offer FREE shipping on any purcahse over $75.00 what a great deal! Susan S. Disclosure: The reviews and or opinions on this blog are my own opinions . I received a bench to review. No monitory compensation was received. I was not required to write a positive review. Your experience may differ. The opinions I have expressed are my own I am disclosing this in accordance with the Federal Trade Commissions 16 CFR Part 255: Guides Concerning the Use of Endorsement and Testimonials in Advertising .